Whether you need a Christmas party enterainer or a company party entertainer, we can help match you with the perfect entertainer to make your party a success. Enjoy your holiday season, and your party, while we do all of the work for you. The right entertainer will make for a wonderful and memorable event. Our experienced team will be able to provide you with lots of company entertainment options. 1. Are you comfortable with the company party entertainer as a person? You want to know about this person that will be representing you and your organization. You don’t need to know every little personal detail, but you should know them enough to be certain their behavior at your event will reflect good upon your company. 2. 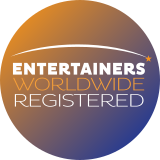 Do you trust the entertainer to deliver 100%? If you have a little voice in your head warning you, now is the time to listen. Don’t wait until later when it is too late to change your mind. Do they return phone calls promptly? Do they ask relevant questions about your event? Do they seem knowledgable about the type of event you are planning? What you have experienced so far is an indication of what you can expect in the future. If they have been slow to respond, excuse prone, or seem unprofessional, I would run as far away as possible! Event planning can be a high risk business, and many things can go wrong. By answering these questions when booking a company party entertainer, you will minimize your risks and maximize your rewards. Have a terrific event! Copyright 2017 © Larry G. Jones • All Rights Reserved • Designed by ClickConvertProfit, LLC.